From the forward by Al Mann: "The true art of mentalism is not the illusion of the stage that enchants the eye but the illusion created in the mind that enchants the thought. The mentalist's greatest gimmick is hidden in the inner recesses of his mind and therefore invisible and unexposable. This manuscript expounds the illusive, seldom exploited and little known branch of magic where the spectator unknowingly executes the 'move' that creates the miracle to the full credit of the magician! The "Headline Prediction" is indeed a headline getter for the magician and mentalist. It is a haunting experience for the beholders. The magician pierces the time barrier by predicting the future in writing in a sealed letter that is never again touched by the magician or any one in his company after the letter is mailed or delivered! ... This is the highest form of magic!" 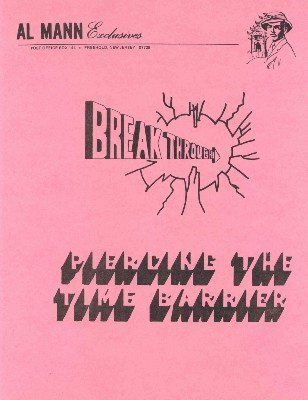 Along with his "Break Through" effect, this manuscript also contains material on the "Walter's Letter" effect which Al Mann learned from Walter Gibson in 1976.